New Orleans, LA – Fisher Vollendorf of Fayetteville, who has honed his game by playing frequently on the Oklahoma Junior Golf Tour, and Yujeong Son of Norman are the 2017 champions of the Tommy Moore Memorial Junior Golf Championship, which concluded Thursday at the TPC of Louisiana course. Defending champion Son, ranked #4 in the AJGA Rolex Rankings, won for the third year in a row with impressive rounds of 72-70 (142) that included 5 birdies in the final round. Son believes that maintaining confidence was the key factor in her ability to be a three-time defending champion. “I tried not to feel any additional pressure, but there was a little bit of pressure there since I was behind after the first day. I just had to play my own game out there. However, I was confident since I’ve been playing steady and I haven’t been making too many mistakes,” says Son. In second place was first-round leader and University of Central Florida commit Elizabeth Moon, of Forrest City, Arkansas, who followed yesterday’s round of 71 with a score of 73 for a 144. Closely behind her in third was Mississippi State commit Abbey Daniel of Covington, Louisiana, with rounds of 80-71 (151). Vollendorf was able to hold of the competition after having the first-round lead and claim his victory in the Boys 16-18 division. 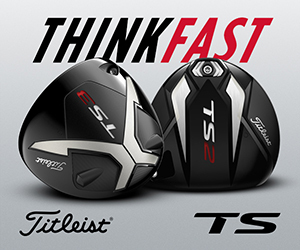 Consistency was key to his round of 68 with four birdies and 14 pars finishing with a 138. He discussed the importance of consistency in his game and elaborated on how it led to his victory today. “Not making a bogey was the highlight of my game today. Consistency has definitely been the biggest improvement in my game over the past year. To follow up a good round with another good round was really encouraging to me,” says Vollendorf. Runner-up was Auburn commit Ryan Eshleman of Birmingham, Alabama, who held onto his position in second place with rounds of 73-73 (146). Closely behind in third place was LSU commit Nicholas Arcement of Thibodaux, Louisiana, with rounds of 73-74 (147). Defending champion Yujeong Son of Norman, Oklahoma, ranked #4 in the AJGA Rolex Rankings, won for the third year in a row with impressive rounds of 72-70 (142) that included 5 birdies in today’s round. Son believes that maintaining confidence was the key factor in her ability to be a three-time defending champion. First-round leader Keaton Vo of Austin, Texas secured his victory in the Boys 13-15 division by one stroke with a par on the last hole and a consistent round of 74 for a 152. He discussed the importance of playing his own game, despite having the lead and elaborated on the strengths of his game that led to his victory. “My chipping and putting was definitely there, which made up for the fact that it was difficult to control my distance today with the weather,” says Vo. Closely behind was runner-up Canon Clark of Broussard, Louisiana, who posed great competition today with three birdies on the front nine and rounds of 79-74 (153). In third place was defending champion Trey Morse of New Orleans, Louisiana, who finished with rounds of 81-73 (154), with his score today being the lowest in his age division. 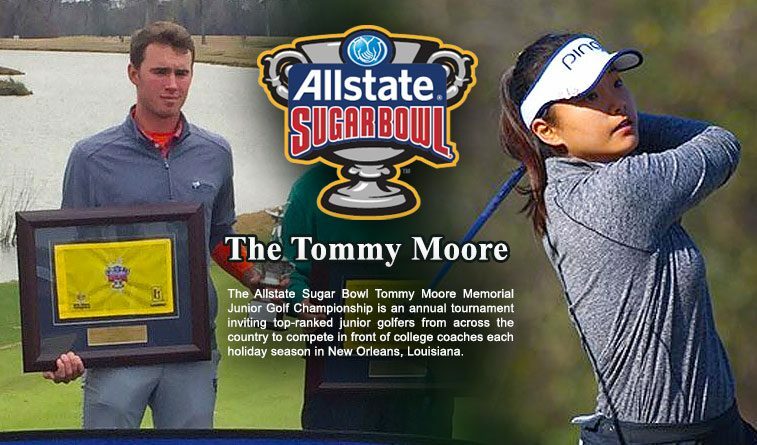 The Allstate Sugar Bowl Tommy Moore Memorial Junior Golf Championship is an annual tournament inviting top-ranked junior golfers from across the country to compete in front of college coaches each holiday season in New Orleans, Louisiana. 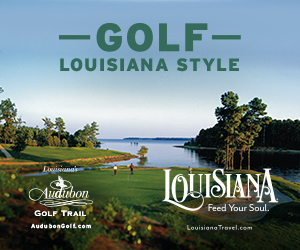 Tommy Moore was the most accomplished junior golfer to ever emerge from the New Orleans area. 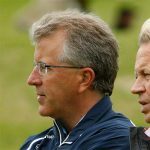 In 1980, Tommy was ranked #1 in the Golf Digest Junior World Rankings and went on to have a decorated collegiate career at Oklahoma State University where he was an All-American, National Champion, and Academic All-American. After playing on the PGA TOUR for three seasons, Tommy Moore’s life was cut short at the young age of 35 due to a rare blood disease. In his memory, the Kelly Gibson Foundation is proud to partner with the Allstate Sugar Bowl to host a national event that recognizes the impact Tommy made on junior golf and the New Orleans community.